There are certain things I can and want to expose my curious 10 year-old nephew to. Particular parts of Persona 5? Yes. Most of the game? Not yet. I’d like for him to be engaged with it in the future. But he’s already halfway there as it’s a fictional, yet too real snapshot of what we’re all living through right now. When you’re 10, I’ve noticed, there’s an absorption of information and a need to be involved in conversations in just about everything. This includes household music, television, and general entertainment consumption. But it also extends to every day discussions. And when you’re 10, living in a household of adults who have taken to voicing audible concerns about our country’s current government administration, there’s bound to be interest in your family’s opinions. Over the past few months, my nephew’s become increasingly aware of the tension surrounding politics and social issues. We’re mindful to not inundate him with the details of every setback we seem to be facing. He’s only 10, after all. But we also know that he needs to be aware. Awareness in how he carries himself. Awareness to treat others with respect. Awareness that there’s a lot of rubbish in this world that’ll be a challenge to him now and in the future. Awareness that he’ll have failures, and that he’ll have successes. We’re trying our best to teach him that all of these very real actions on a daily display have consequences. He may not fully understand the why but he’ll understand that things are happening as a result. And that there are some positive reactions, such as his personally witnessing part of the Women’s March in NYC the day after the inauguration, to lots of the negatives. There are so many talks my family will have to have with him at some point. For now, he’s absorbing some of the conversations that may not directly impact him at this stage in his life but are the sort of conversations that are a tough necessity. He’s learning in his own way, and questioning things that his young mind turns over and wants to grasp. And then he started watching me play Persona 5. 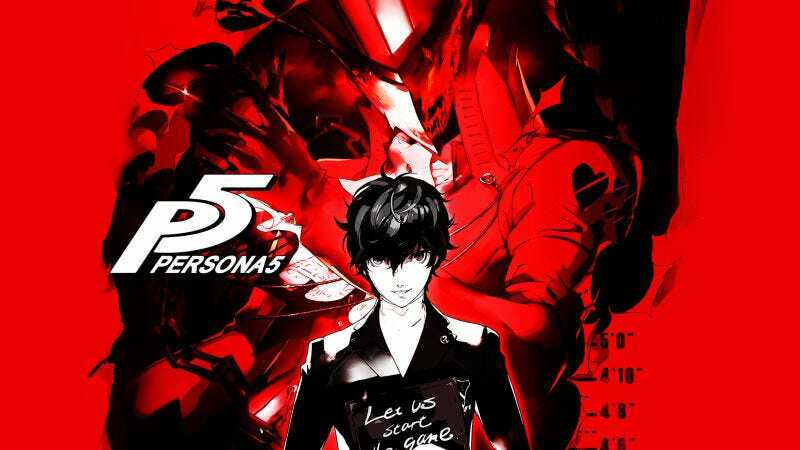 Atlus’ latest game in the series is heavy-handed with moralistic stories of fighting human injustices. These include showcasing some of the worst depravity humans are capable of—enslavement, physical and mental abuse, bullying, sexual assault, murder, and those with self-serving business interests tied to political aspirations. I’ve probably missed a few. The Persona series’ narratives are portrayals which often echo the real-world and humans’ vile capabilities. This time, however, Persona 5 hits hard, feels amplified and is a little too real in our current times. All one has to do is turn on the news or scroll through timelines in social media feeds to see just how eerily on point the game can be. Fortunately for me, when he watches me play it’s usually during a gameplay sequence. It’s when I’m taking down Persona 5's enemies—shadows—or making my way stealthily through any given dungeon. There’s not much story to focus on and it’s just a game in those parts. After an initially loose explanation of why there are demons and an other self—which is significant to the Persona series’ base understanding of accepting parts of true human nature—he’s seen the tamer parts of this videogame in its fighting, strategies, and the occasional feisty demon negotiation. There have been a couple of instances where he’s seen the heavier dialogue involved in the game’s tackling the theme of a form of abuse—bullying. These were the changed hearts in the game’s optional dungeon, Mementos, where some of the cases have not been as involved and explicitly brutal as the main campaign. He’s seen culprits spew hateful rhetoric against another person. He’s seen The Phantom Thieves’ responses and strong will to correct these injustices—albeit with “violence” of their own. He knows ultimately that justice in those (almost) black and white Mementos stories will prevail. For me, some of the Mementos’ missions feel like they’re too rushed with quick fixes and the anticipated (and rightly so but thin) outcry from the characters that’s done through less nuanced dialogues. But for him they serve a purpose to tell a tried and true story in that evil is vanquished—in this case through confessions of criminality and vows to repent—and is stopped because the heroes win. At 10, he’s very interested to know just how my main character ended up in an interrogation room. He’s more interested in how I win a boss fight, and the catchy music that plays when I’m on a final push to change a villain’s heart to be remorseful. I’m very careful to shoo him away or switch off the PlayStation 4 when there are scenes that are too adult-oriented for his age bracket. I can’t yet share with him the parallels to the real world that he’s already unknowingly living. And so, he hasn’t seen many of Persona 5's deplorable humans that are so reflective of true human nature. Persona 5 doesn’t always come with easy solutions to the game’s many scenarios. Deeper details highlight the greys of reduced concepts of good and evil. There are harder discussions at play. And those, along with the atrocities on display by the villains, are the parts to the game that I’d like him to see (and play directly) when he’s old enough to understand. Unfortunately, these are the unavoidable things he’ll learn on his own as he ages and his life experiences change. He’s not old enough yet to digest all Persona 5 tries to get across, and the rawness of how the game delivers it. So for now, my sharing of the game with him extends as far as letting him watch me fight a tough demon or dungeon crawl with an occasional lesson in how horrible people are through the game’s more easily expressed situations—some he’s probably already faced, is facing, or may as time progresses. I only wish life could limit experiencing those atrocities in a virtual place such as Persona 5. A simplified idealistic want on my part for him, considering the game so expertly, and tragically, is an example of art imitating life. Which Game(s) Defined Your Childhood?